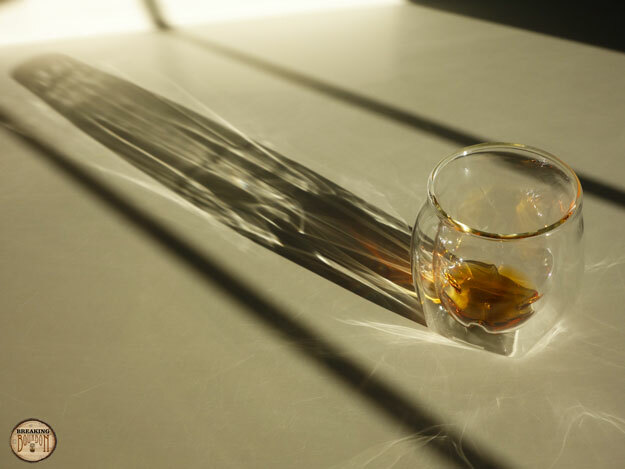 In late 2015 whiskey drinkers everywhere became mesmerized by a new piece of glassware offered up on Kickstarter, the Norlan Glass. 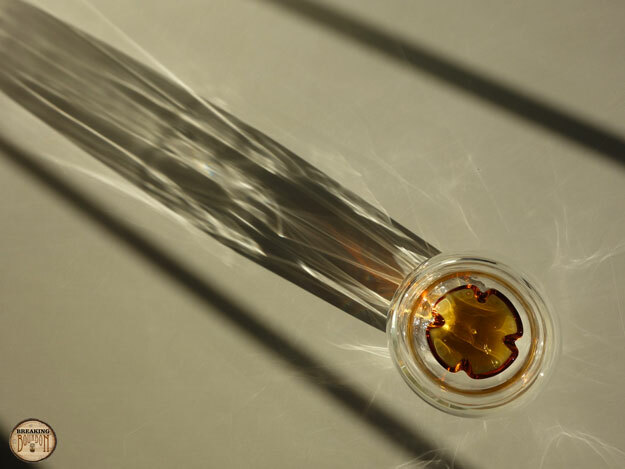 Norlan’s claim was pretty bold: “Meet the glass that will change whisky.” Norlan backed this up with a detailed explanation describing the lengths they had gone to make that claim, both scientifically and aesthetically, and whiskey enthusiasts bought in pouring an incredible amount of money into the project. The company’s initial funding goal of $75,000 was exceeded more than tenfold, with nearly 11,000 backers and over $800,000 raised. 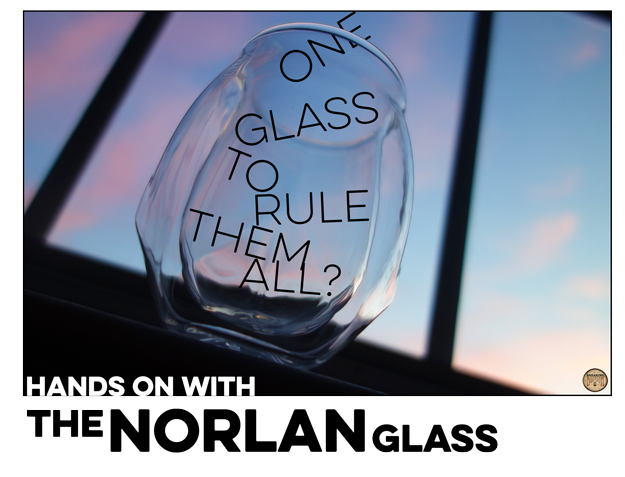 The majority of backers claimed a set of two glasses for a pledge of either $35 or $38 depending how quickly they backed the project. The full retail price for a set of two glasses was expected to be $48. I was one of those backers. Or more accurately my wife was, as a gift for me. But honestly if she hadn’t backed the project I would have. I was sold based on aesthetics alone, as the Norlan Glass is a work of art. Considering the amount of time I spend with a whiskey in hand, it would surely get put to good use. Now before I get into this, I will say that while much of what the glass offered did pique my interest, I didn’t buy into all of the marketing or claims made by Norlan. One thing in particular was the social aspect of keeping eye contact while sipping whiskey, which seemed a bit silly to me. A problem that doesn’t need to be solved. But I really liked the idea of a tulip or Glencairn-like shape on the inside with a rocks-like glass shape on the outside. Lately I’ve found myself drinking neat from a rocks glass more often than not, despite having a cabinet full of Glencairns, Riedels, and NEAT glasses, to name a few. Aside from drinking for review purposes (of which I always use a Glencairn), I find the feel of a rocks glass in my hand to be more satisfying and tend to pull that over a Glencairn for casual drinking. Unless it’s a new whiskey or one being analyzed for a review, I typically don’t spend a lot of time specifically nosing whiskey that I’m already familiar with and the wider rim of a rocks glass still lets me take in a bit of scent naturally while I’m sipping. I’ve also found I can nose a whiskey better with a NEAT glass than a Glencairn, but only if it’s filled to a perfect level and only with my nose pretty much buried in it, face pressed up to the glass. A sure way to make being a whiskey geek seem even more geeky, it turns out. To be honest, I rarely reach for a NEAT glass as a result and only tend to use the Riedels when I run out of Glencairns during larger tastings. 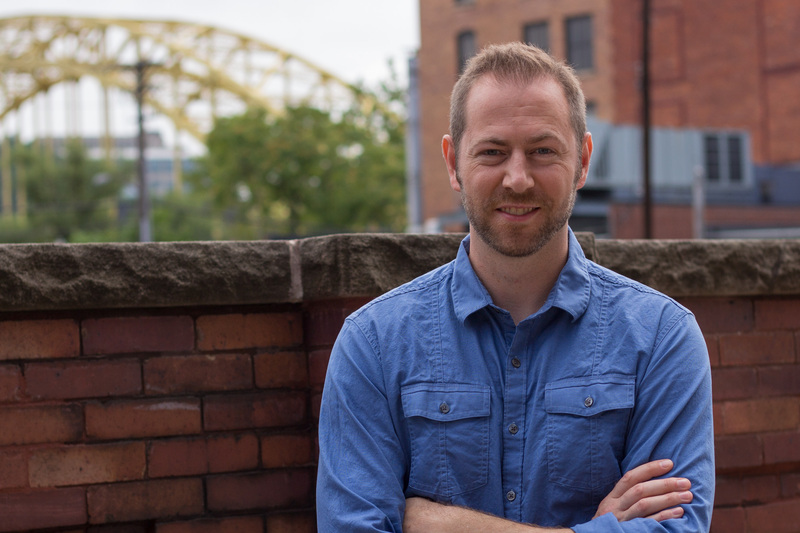 Will Norlan replace the Glencairn? For me, not entirely, but there are aspects I like better. Am I happy I have a set? Absolutely. Would I recommend adding them to your glassware collection? Yes, but only if the price isn’t an issue. I would prefer to see this closer to Kickstarter pricing than retail $48 for a set of two. Of my various glasses, which one do I think I’ll use the most over the next year? Norlan Glass. Is there anything I would change about it if I could? Yes. First and foremost the Norlan Glass is hard to put down. 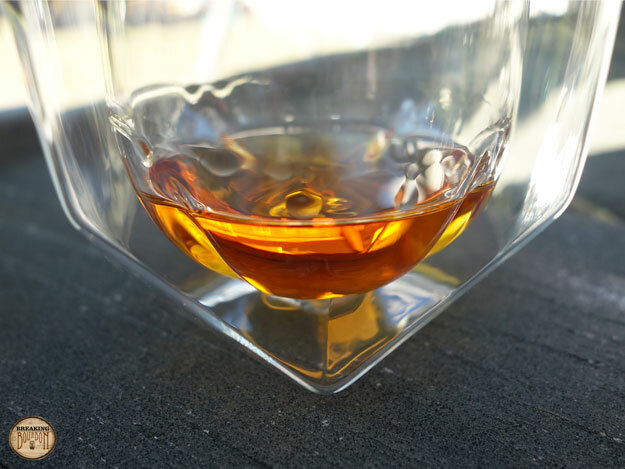 If you enjoy swirling your whiskey in the glass the Norlan is hard to take your eyes off of. 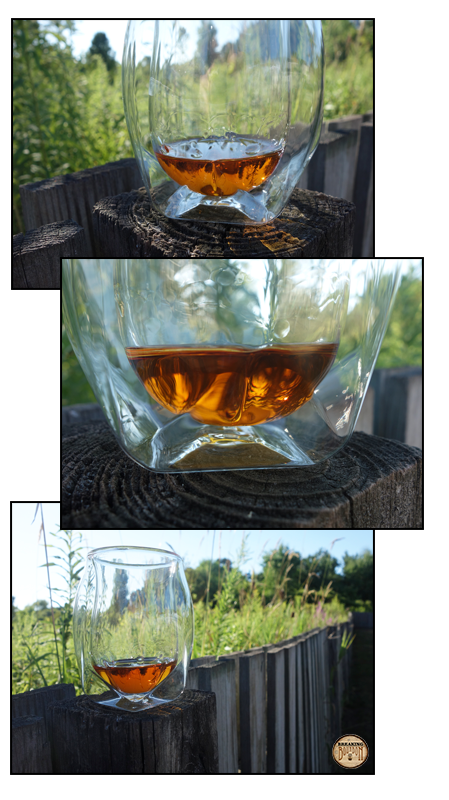 It’s beautifully designed and this alone enhances the drinking experience as you contemplate the whiskey inside it. However, it won’t replace the Glencairn for critical analysis for me because it makes nosing lower proof and lightly scented whiskeys more difficult by comparison. I asked a few others to compare the scents of whiskeys given off in the Norlan against the Glencairn, and it seems those with better noses generally prefer the Norlan, while those of us with average or weaker noses often had trouble picking up scents in the Norlan and prefer the Glencairn. With that in mind, the Norlan does help dissipate the alcohol better on those higher proof burners allowing the other scents to cut through better than a Glencairn. This is important as one of the critical design aspects of the glass is to improve the nosing experience. 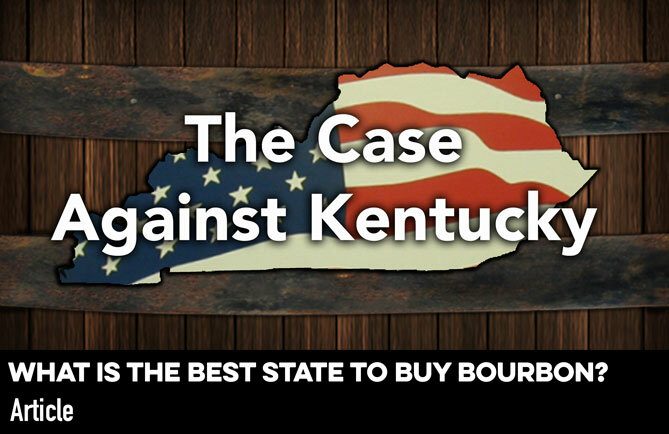 Though I feel they have succeeded in achieving this goal to some extent, I also feel the success will vary on a person by person, whiskey by whiskey basis. 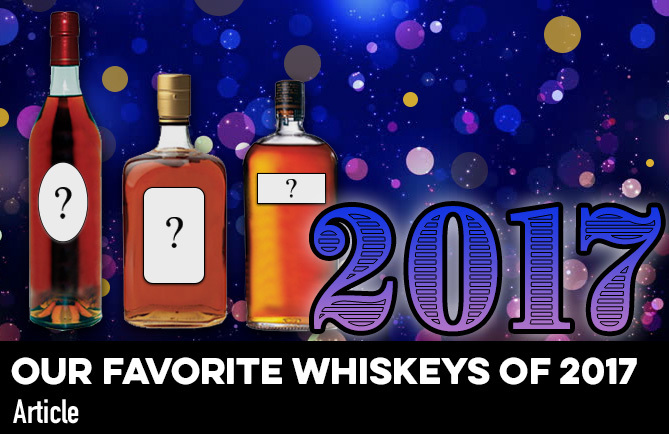 In my case, the Glencairn still comes out ahead with respect to critically analyzing the nose of a whiskey based on the handful of whiskeys I’ve compared so far. That said, I can’t imagine being a whiskey enthusiast and not adding these to your glassware set if you enjoy drinking your whiskey neat. These aren’t cheap coming in at over three times the price of Glencairns, but unless that’s a dealbreaker it’s the best looking piece of whiskey glassware money can buy. The wide rim is comfortable to sip from and it feels great in my hand, more like a rocks glass while staying more true to the technical tasting aspects than a rocks glass due to its internal design. To that end, I see myself using a Norlan Glass more than any other glass for casual neat drinking in the foreseeable future. But it’s not perfect. And no glass ever will be. There are a few things I might do differently. First, it’s a complex design with two thin layers of glass. The thin layer extends to the base, making it the thinnest base on a piece of glassware that I’ve ever seen. I’ve never really given this much thought with any other piece of glassware, but when I set it down on my marble desktop or a ceramic coaster it sounds hollow (it is hollow, after all) and feels more fragile than I would like it to. Second, the dual layers of thin glass also make the glass quite light, and I feel like it would be more satisfying if it was a little heavier. Both of these issues might be fixed by making it solid instead of hollow with two layers of glass, or at least figuring out a way to thicken up the base a bit but still retain its beautiful design. 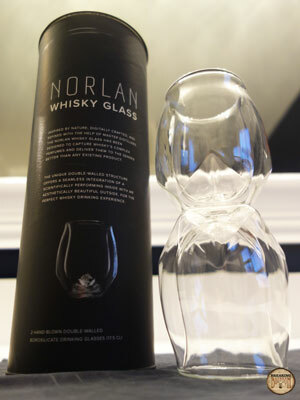 All in all I really enjoy the experience provided by the Norlan Glass and recommend adding it to your whiskey glassware collection as a result. 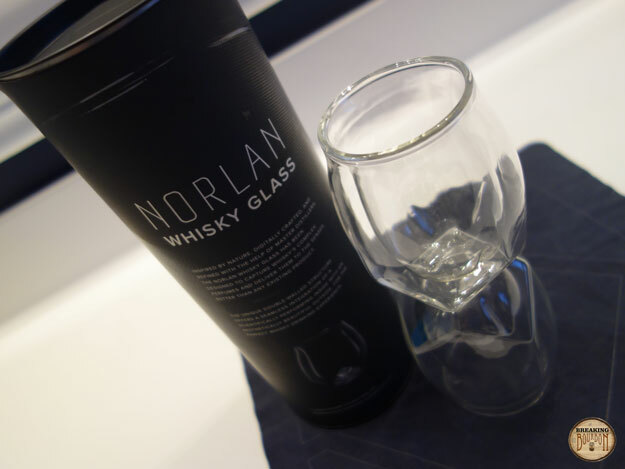 Have you used a Norlan Glass yet? What do you think?